I had an outfit planned for the event, but when I tried it on, it didn't seem right for the night, so off I trotted to River Island. No matter if I have weeks in advance to plan or a couple of hours, I know they can always sort me out. I really wanted to wear my beautiful new shoes from Public Desire, so I needed something to compliment them. Another thing I love about River Island - it's always in colour coordinated sections, which for me, being as OCD as I am, I LOVE! As soon as is walked in, I spotted this blouse sitting amongst other burgundy coloured items and knew straight away it was perfect- with Khaki and burgundy being huge colours this autumn. I knew I had my River Island black skinny jeans in the house, along with my new hat in the same colour, so it would all tie together - I just needed to find a coat and bag to finish it off. Making my way to the changing rooms, there was the most beautiful coat, I lifted it up only to see if had a sale ticket on it. £85 reduced to £40; sucker for a bargin and needless to say no questions or quams were made about this- it was mine! All I needed was a bag, I usually take my Mulberry with me everywhere, although this time it didn't go with the outfit at all, so I was on the hunt again- but again, not for too long. The last one of this 'new in' slouch bag in the same khaki green colour- I swear it's like the shop knows I'm coming and has everything I want there! 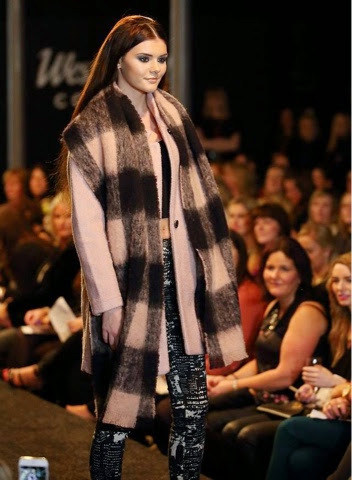 That was me all sorted, so I made my way to Belfast with my friend to a sold out showing of AW14 by Excel Clothing. I had never been to BFW before so I was SO looking forward to it, and it didn't disappoint. Walking in to the cool new venue, we were greated by photographers, camera crews, hostesses and enough West Coast Coolers to probably get you to the West Coast and back! We had our photo taken by a lovely photographer for the Ulster Tatler which was great, but then a lady approached me with a video camera and asked me to do interview of what I was wearing as she called me a 'style steal'. I had never had an interview before so I was so nervous-even though it only lasted a short time. I really did love my last minute outfit and was so complimented someone else did too. 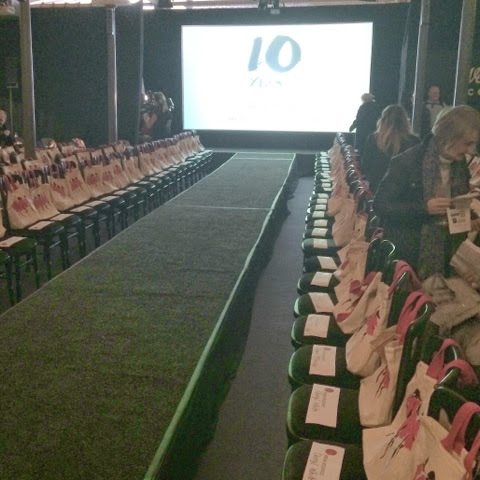 We made our way to our seats and the catwalk started, showcasing AW14 from brands such as: Ted Baker, Millie Mackintosh, Hugo Boss and lots more. So many beautiful pieces I seen on the runway that I only wished I had, and I was so glad to see my favourites pastels and monochrome staying in amongst them. One of my favourite looks was from Maison scotch, kind of combined the two together- a match made in heaven in my eyes! 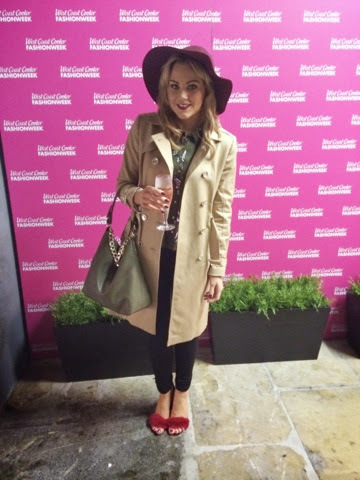 And another was the Millie Mackintosh collection, which I thought was priced really well. (So I will maybe have to treat myself!) There was a dress shown on the catwalk with bare legs, and then a lady sitting infront of me had worn it with tights, so it was great to see how well it looked both ways and that other people not just the stunning models looked good in it!